We’re big fans of Union Bindings so we were excited to see their 2018 additions. Our visit with them did not disappoint, as they have some great new stuff for next season. First thing that caught our eye was Union’s Expedition splitboard biding. The Expedition binding looked very solid for their first year in the splitboard realm. 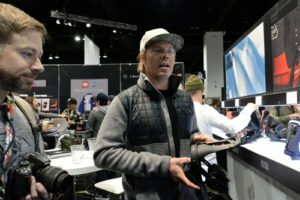 We were very fortunate to catch up with Travis Rice at the Union booth. Travis show us his new signature bindings, the Falcor. The Falcor features a “Forged Hybrid Beam” in a stripped down highback. Union also has a new model for 2018, the STR, which features a lot of the tech from the Atlas but at a much lower price point. Capita Snowboards continues to crank out killer shapes and graphics from their eco friendly facility in Austria. Featuring pro models from rippers like, Scott Stevens, Jess Kimura, and Kazu Kukubo. 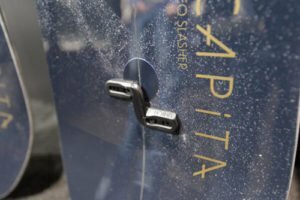 Capita also enters the splitboarding demographic with their new Neo Slasher Split.